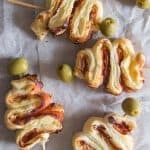 Simple Savory Christmas Trees, store bought puff pastry makes these cheesy salami Christmas Trees the perfect Holiday Appetizers. Simple Savory Christmas Trees are so easy to make and even better to eat. They were a big hit with family and friends. I am a big lover of Puff Pastry, I think it must be an Italian thing. Puff Pastry is easily available in all grocery stores not just in the frozen section but also the fridge section, so no need to defrost, works for me. I have made my own Pastry and it turned out really well, very easy and delicious. But when you need something quick, store bought works great. It was another one of those things that I discovered in Italy, my Mom made her own pie pastry but never puff pastry. 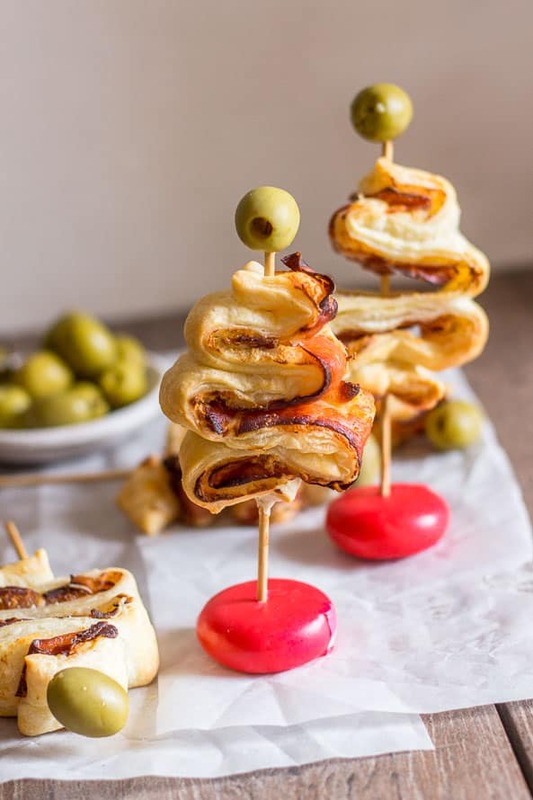 A couple of weeks ago I made the Sweet Version of these Christmas Trees so on a whim I decided to serve a savory copy cat Appetizer for lunch. While I was in the grocery store I was drawn to a package of Puff Pastry (what’s new) and I thought Christmas Trees! If for some reason you don’t life puff pastry you can always use regular dough. 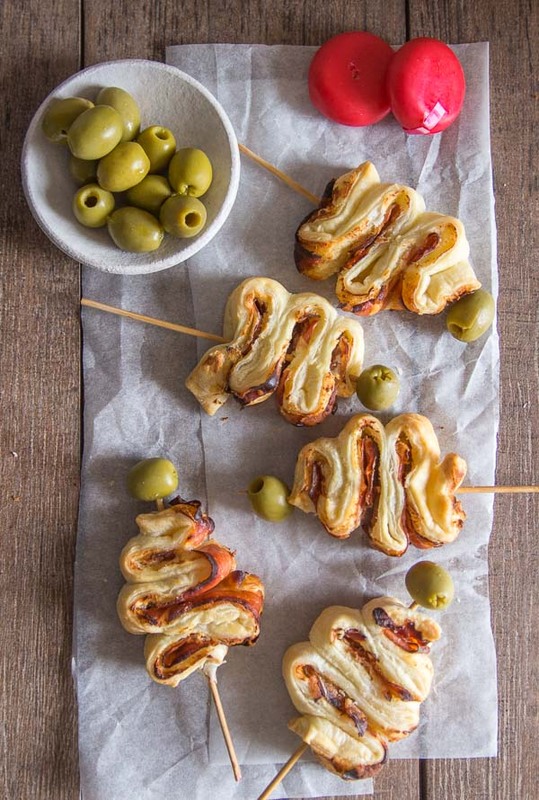 I didn’t want a melty cheese, I needed something for easy roll ups and a cheese that wouldn’t melt all over the place. 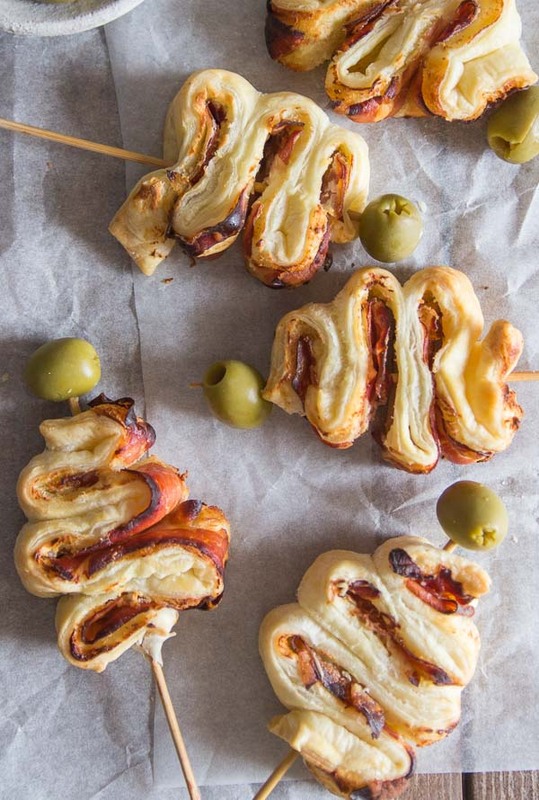 More Delicious Recipes made with Puff Pastry! Some cream cheese mouse caught my eye and what’s perfect with that? Yup some sliced salami. I picked up some of those round wrapped swiss cheese bites and I knew some green olives would be the perfect “star” for my trees! Enjoy. 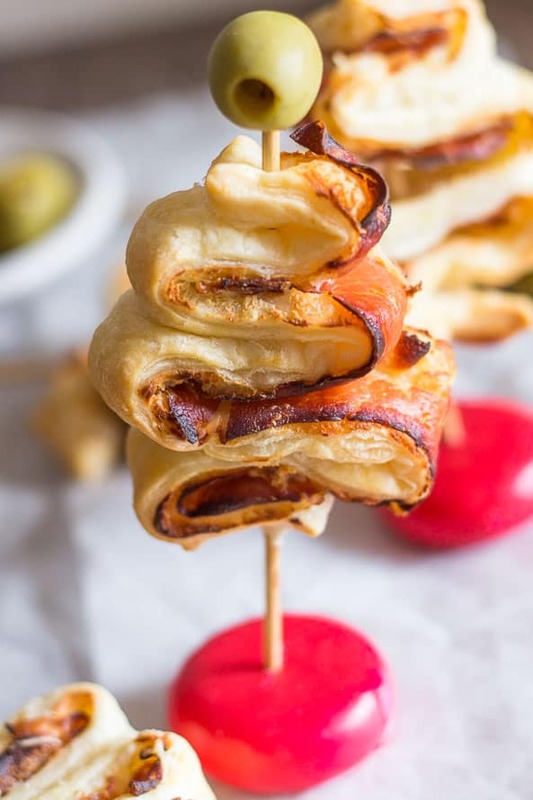 Simple Savory Christmas Trees, a fast & easy delicious puff pastry appetizer made with cream cheese and salami or cold cut of choice. **if you can't find cream cheese mousse then use softened cream cheese (make sure it's spreadable). Roll out Puff Pastry (or defrost completely if frozen) lightly roll to smooth out. 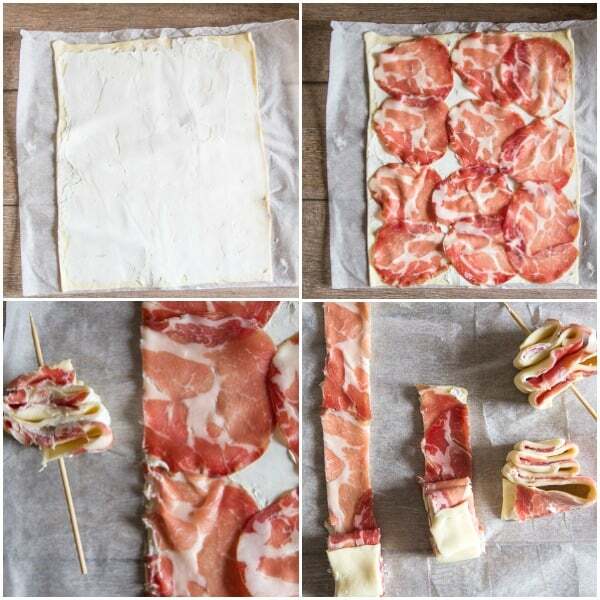 Spread with cream cheese mousse and top with salami slices, then slice into 9 or 10 strips lengthwise. Fold the strips of dough accordion style, start with a small amount and widen as you go (until you reach the end). Place a long skewer in the center starting at the base then through to the top of the tree. Place on a parchment paper lined cookie sheet. Refrigerate for 20-30 minutes. While strips are in the fridge pre-heat oven to 350°. Remove from fridge and bake for approximately 15 minutes or until golden. If desired top each tree with a green olive and stick into a hard square of cheese or serve as is. Enjoy! Never worked with puff pastry before. Hi Nancy, I have only seen puff pastry with one sheet (phyllo pastry has more sheets), so one sheet is used. Add the filling, cut into strips (as per photos) and fold each strip accordion style. Stick in the stick in the middle and bake. Hope that helps. Those look cool! How long will they keep? Hi Bet, I really don’t think these would keep for long, they should really be made and eaten asap. Have a wonderful Christmas. Oh dear ! So simple, easy to make and so to fall in love with ! Perfect solution for festive days to come.pinning and baking ! Thank you so much ! Happy holidays ! Thanks so much, I hope you enjoy them.